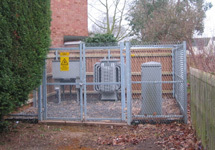 Most distribution substations are outdoors, with the individual components - transformer, switchgear, fuseboard - separated but reasonably compact, and the whole substation surrounded by a perimeter fence. (Modern substations are often a "unit" design which is even more compact.) The combination of the compact equipment and the minimum distance of approach imposed by the fence mean the magnetic field in publicly accessible areas is fairly low, typically a couple of microteslas. 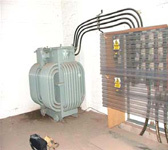 Some substations, however, are inside buildings, and historically have sometimes had the equipment laid out more spaciously, and closer to the walls as well. These can produce higher fields on the other side of the wall. The building can be a stand-alone building built for the substation, like this one, in which case the higher fields may be experienced by walking close to the wall. But it is unlikely that people would spend very long there. Other substations can be built into a bigger building, for example a block of flats or appartments in a converted industrial building. Then it is possible for the space the other side of the wall to be a more public area or part of someone's home. This page is referring to substations inside proper brick or concrete buildings. 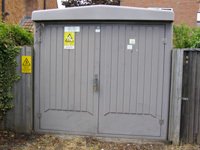 Some modern substations come inside an enclosure, typically fibreglass, like the one in this picture. They have compact "unit" equipment within them and produce no higher field than a traditional outdoors substation . What fields do they produce? Higher than usual magnetic fields can be produced by the cables connecting the transformer to the fuseboard, or from the fuseboard (also known as the "LV Board") itself. In both cases the fields arise because the individual conductors may not be very close together, meaning there is less cancellation of the magnetic field. And because they are fastened to the wall or ceiling, and depending on the layout, it may be possible to get quite close to them on the other side of the wall or ceiling. This is by contrast with normal outdoor substations, where the equipment may be more compact, and is usually a bit away from the perimeter of the substation, towards the middle (though some outdoor substations may have the equipment right on the perimeter and hence produce higher fields). "Unit" substations have the fuseboard physically attached to the transformer, eliminating the separate cables altogether. The field depends on the exact layout and on the current. Right up against the other side of the wall from the fuseboard, fields of 50 µT are occasionally found. In exceptional circumstances this could go up to over 100 µT. We have never measured anything above 200 µT. These highest fields are localised to the point on the wall that corresponds to the position of the fuseboard on the other side. They also fall rapidly with distance from the wall, typically halving at 20 cm away and halving again after another 20 cm. Do these fields comply with the exposure guidelines? Yes, even these rare high fields are still compliant with the relevant exposure guidelines. The exposure limit for the public for uniform magnetic fields is 360 µT, and we have never yet found a field this high. Even if the field could theoretically be higher, it varies so much with position that the coupling to the human body is less effective, and the "basic restriction" - the actual limit on the induced current in the central nervous system - would not be exceeded. What is the electricity industry doing about these situations? These situations do still comply with the relevant exposure limits, so there is no requirement on the electricity industry to take steps to remove them. DNOs to consider instances of substations producing elevated exposures when requested and, where practically feasible, to offer options for reducing the exposures at the consumer’s choice and cost. DNOs to record instances of substations producing particularly high exposures so that EMF issues can be factored in to future investment and maintenance decisions for that substation." In practice, for an existing substation, this means that when it next needs refurbishment or replacement, the electricity company will look to see if they can use more compact equipment, or if they can move the high-field components away from walls that adjoin public areas. This may not always be possible, or may be unreasonably expensive, but the industry will always try to do so if it is reasonable.